Dorland's Illustrated Medical Dictionary is the definitive resource to help you understand and correctly use all the latest terminology in today’s ever-evolving medical field. This 32nd Edition lets you enhance your understanding of all the current medical terminology in your field with more than 120,000 well-defined entries, 1,500 illustrations, and 35,000 audio pronunciations. You'll find the very latest medical terms used today with more than 5,500 new entries drawn from current sources and 500 new illustrations. LATEST APP UPDАТES: • Learn in style with any of the four colorful new themes – The colorful layout will turn your learning experience into an enjoyable routine. 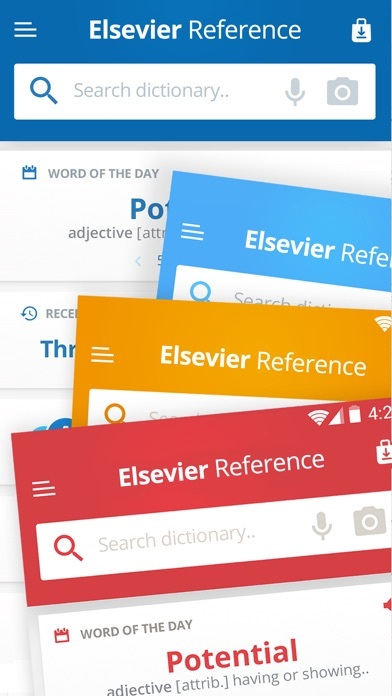 Customize your dictionary and benefit from the cheerful mood your favorite color brings you. • Dive right into the intricacies of the language - With new and convenient Home page, sleeker and more intuitive visual layout, as well as innovations in the speed of searches, you can get to the desired entry faster than ever. 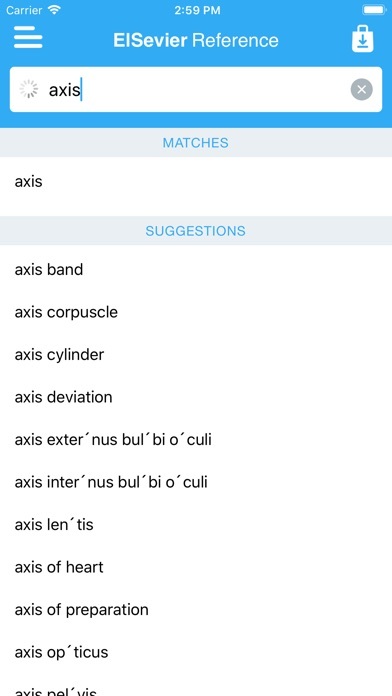 SEARCH TOOLS - quickly find words with the clear, functional, and easy-to-use interface. Designed to provide the most comprehensive search experience, the dictionary combines several search tools to match or predict what are you looking for, including: • Search autocomplete helps you find words quickly by displaying predictions as you type. • Keyword lookup allows you to search within compound words and phrases. • Camera search looks up words in the camera viewfinder and displays results in seconds. • Voice search helps you find an entry when you don’t know how a word is spelled. Looking for a specific word but don't know how it's spelled? We've got you covered with our automatic ‘Fuzzy filter’ to correct word spelling, as well as ‘Wild card’ ('*' or '?') to replace a letter or entire parts of a word. LEARNING TOOLS - engaging features that help you further enhance your vocabulary. Designed to give you freedom to structure your studies, the dictionary combines several learning tools to help you be more organized, including: • ‘Favorites’ that allow you to create custom folders with lists of words. • Recent list which helps you to easily review looked-up words. • Swipe-to-delete functionality in the Recent and Favorites menus. • Word-of-the-day option to teach you a new word every day. Feel excited by the new word or definition you just learned? Share your discovery with friends on social media, email or any other option available on your device. 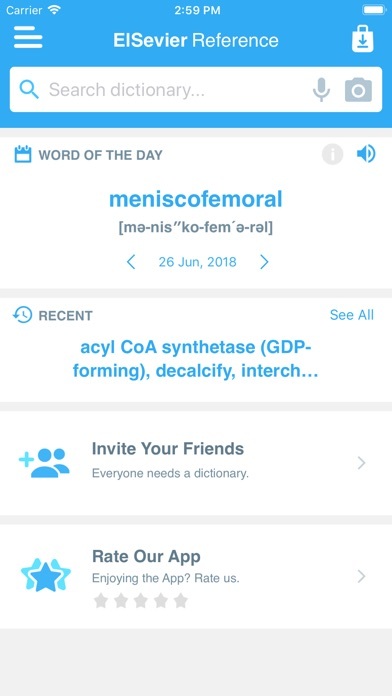 Compared to some other Medical Dictionary Apps, I feel this one is limited in content, user ability and the interface isn’t as smooth. The incessant requests for a rating are highly annoying on a paid app. Amazing, informative and Wonderful dictionary. It has been an essential pillar in my personal library since 1971. Dorland's Medical Dictionary has been and will continue being an Institution by it self for students and medical professionals. Very helpful and handy in my iPad. It is the best one, usifull and reliable reference. 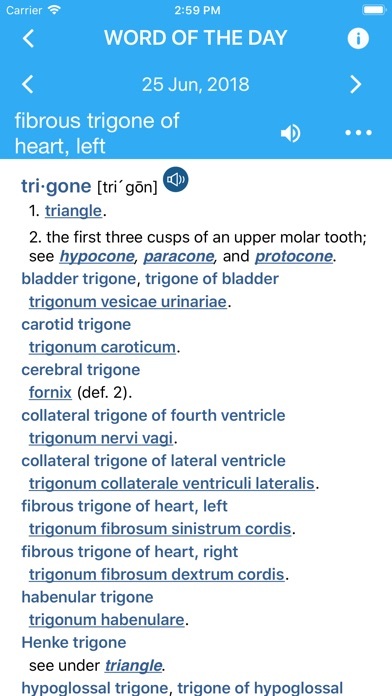 Dr.Shawna here, the app is great in teaching daily medical term knowledge. I enjoy the persistence of the participation demanded through the app. The is extremely heavy and hard to travel with. This is excellent in its design and updated structures. Thank you. Please, stop asking me to rate the app. And also for the amount of money it costs, you really need to improve it.